The political and social revolutions that took place in Mexico between 1910 and 1930 produced an explosion of artistic activity. Mexican artists challenged the European influence of academic painting by exploring their pre-Columbian past, the macabre social consciousness of Spanish painter Francisco de Goya, and groundbreaking modernist styles—decisions that successive generations of artists would in turn react against. The various movements that characterized Mexican art are represented in Orlando City Hall’s most ambitious exhibition this year, Three Generations of Mexican Masters. 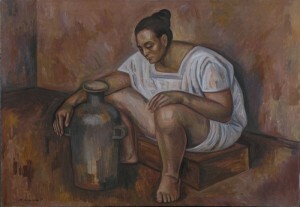 Included is Diego Rivera, who rejected European trends for the realism of Mexican life. He painted large murals of contemporary historical events on the walls of government buildings, schools, and public spaces—work that is exemplified by his 1928 charcoal drawing In Russia. But Rivera had a sentimental streak. His watercolor Seated Woman (1949) portrays a mother and daughter resting outdoors as an erupting volcano in the background offsets the peaceful scene. Rufino Tamayo rejected the politically engaged murals of his peers for a personal style that reflects Mexican folk heritage. 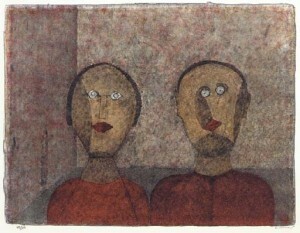 His 1990 lithograph La Pareja displays a couple standing side-by-side with matching red lips and shirts. Perhaps Tamayo meant for this piece to be a mirror held up to all Mexicans. Reds, yellows, grays, and greens blend together like fuzzy wool in a stunning mastery of the printing process. Reyna Castaño leans heavily toward abstraction with rustic, geometric shapes set against a bluish-white background in Espacio Para La Luz (1994), with its thick oil paint protruding from the canvas like a stucco wall. Eva Maya’s 1997 landscapes show tropical birds, flowers, and everyday objects in dense tropical forests. What initially seems like hideous, touristy artwork gives way to fascination as the viewer discovers that traditional perspective, balance, and proportion are out of whack in the gaudy crayon drawings. Absent from the exhibit is Rivera’s wife Frida Kahlo, a strong female presence in both Mexican art and Surrealism. But her truancy is made up by Roberto Montenegro’s Feminine Torso and Still Life (1965). Like Giorgio de Chirico, he transforms classical subjects via an avant-garde approach. Originally published as “Evolutionary Exhibit Is Sensory Fiesta” in the Orlando Weekly on October 29, 1998.